Prepare your red carpet outfits and dancing shoes, it's going to be a blast! 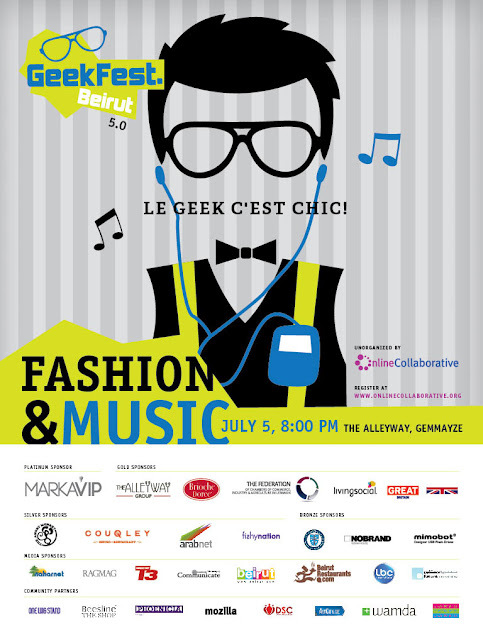 Geekfest 5.0 will bring out all that is geeky in fashion and blend it into the urban tunes of modern Lebanese Bands and Performers. Though geeks would not admit they are into fashion, we do know that there is a certain subcultural attire associated with them and we are about to expose it to the world! Toni Yammine | Crowdsourcing Music Videos – Meen the Band | Toni is a Lebanese musician/director. He likes chocolate so much, and knows how to count very well in both Lebanese and English. He also has an RC plane and tweets on @toniyammine. Hind Hobeika | Smart/tech clothing and where that’s all heading? | Hind is an engineer, swimmer and a self-tracking geek at its most! Beshr Kayyali | Making Arabic Indie Music Popular Sawt.com | Beshr is a true Geek through and through. He has worked on many successful web projects for geeks apart from his day job as a developer. Bassam Jalgha | Live Demo How to Build an Audio Synthesizer in 10 minutes Using Open Source Information | Bassam is a maker by heart. Always high on solder fumes, he works with electronics, build robots. He is into the DIY cult and tries to annoyingly spread it among his entourage. Check him out on www.depotbassam.com. Loryne Atoui | Fashion for a cause | Loryne is a graphic designer impassioned by a crusade against breast cancer as well as travel and photography. 9:30 | On the Catwalk! House Music by DJ G.
The Union’s Space in Gemmayze will be turned into an art expo featuring an exhibition on how Music influences art by Sandra Issa. Entry to Geekfest and participation in all of its side events is FREE, however, you may choose to reserve a place for dinner or drinks & snacks at two of The Alleyway's locations or have anything on their menus. These deals are made solely for GeekFest Beirut attendees. Reservations are processed here. Couqley Dinner Formula for LL 29,000 | [Starter + Main] or [Main + Dessert].